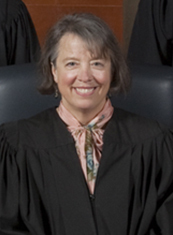 Judge Alexandra Davis DiPentima was born in Sharon, Connecticut in 1953 and raised in Kent, Connecticut. She was graduated from Princeton University, receiving an A.B. in intellectual history in 1975. From 1976 to 1979, she attended the University of Connecticut School of Law and was graduated in 1979. From 1979 to 1981, she worked as a staff attorney for Connecticut Legal Services, Inc. in Willimantic, Connecticut, representing low income persons in domestic disputes (especially spousal abuse and custody issues) and housing disputes. In 1981, she joined the Hartford law firm of Moller, Horton & Fineberg, P.C., and in 1985, she became a principal in the firm. While associated with the firm from 1981 through 1993, she litigated products liability and other personal injury actions at the trial court level and enjoyed an active appellate advocacy practice. In November of 1993, Governor Lowell Weicker appointed her to the trial bench as a Superior Court judge. On May 13, 2003, Judge DiPentima was sworn in as a judge of the Appellate Court. On March 29, 2010, Judge DiPentima was sworn in as Chief Judge of the Appellate Court by Chief Justice Chase Rogers. During her years of practice, Judge DiPentima was an active member of the Connecticut Bar Association, serving as president of the Young Lawyers Section from 1989 to 1990, and as a member of the Hartford County Bar Association, where she served as treasurer from 1993 to 1994 and as a director from 1990 to 1993. Each year since the late 1980s, she has written one or two chapters of annotations for the Connecticut Superior Court Civil Rules Annotated (Thomson Reuters). Since her appointment to the bench, Judge DiPentima's assignments have included presiding judge of the Hartford and New Britain Housing Divisions, presiding judge in Meriden and, from 1998 to 2003, Administrative Judge of the Judicial District of Litchfield. She has served on the Rules Committee of the Superior Court and the Judicial Education Committee, and is currently co-chair of the Advisory Committee on Appellate Rules. From 2001 to 2002, she served as president of the Connecticut Judges Association. In 2010, Judge DiPentima received the Connecticut Bar Association’s Henry J. Naruk Judiciary Award. In 2011, she received the Distinguished Service Award from the University of Connecticut School of Law Alumni Association. In January of 2012, Judge DiPentima became an Adjunct Professor at the University of Connecticut School of Law. In June of 2007, Chief Justice Rogers appointed her to serve as chair of the newly-formed Public Service and Trust Commission, which created a five-year strategic plan for the Judicial Branch. She continues to oversee the implementation of the Judicial Branch's strategic plan. From 2012 to 2016, Judge DiPentima served on the Executive Committee for the national organization Council of Chief Judges of the State Courts of Appeal, and continues to be active in that organization.